In order for ETO to function correctly, the website data settings in Internet Explorer need to be modified. Specifically, the Temporary Internet Files settings need to be modified. 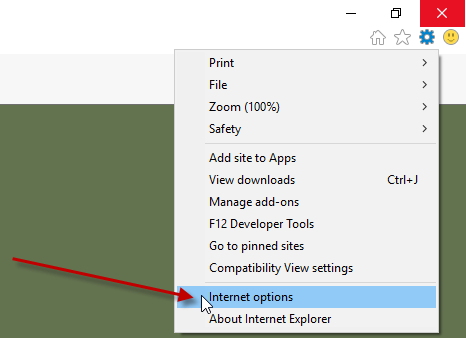 These settings control Internet Explorer’s behavior when using the Temporary Internet Files location, which stores the cache of content for webpages that the user visits. In regards to ETO, this setting is crucial because users are constantly changing the content on their Enterprise.Steps to modify cache setting. In Internet Explorer 11, click on the icon at the top right of the screen shaped like a gear or cog OR click on the Tools menu. 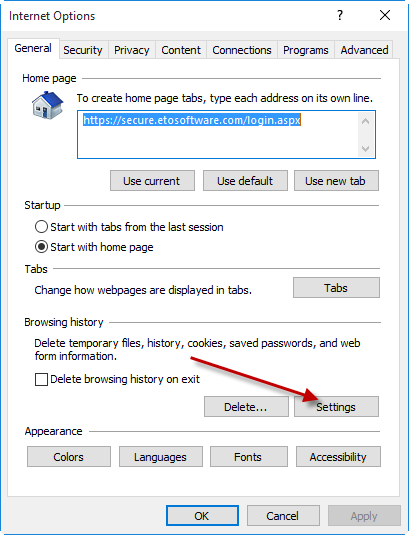 3.In the window that pops up, navigate to Browsing history and click on Settings. 4. The Website Data Settings window will pop up. 5. Under “Check for newer versions of stored pages:” section, select “Every time I visit the webpage.”Internet Explorer will check to see if the content within ETO has changed since you last viewed it. 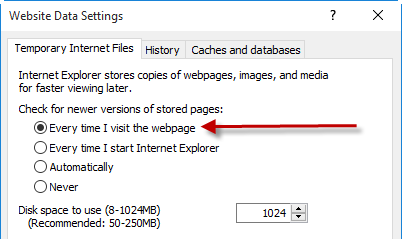 If it has changed, Internet Explorer will display the new page and store a copy of it in the Temporary Internet Files folder. Using this option will guarantee that the user is viewing the most current content from that page and not content that was stored in your Temporary Internet Files. 6. Close out of both the Website Data Settings window and the Internet options window. 7. Restart Internet Explorer in order for the settings to take effect. Click here for more information on Website Data Settings.